The Board is happy to announce that Rev. Catherine Erwin, pastor at Faith Community United Church of Christ in Prairie Grove has agreed to provide pastoral care to our congregation as needed. She will come to TOL on March 11th toward the end of our service so that you can meet her. Rev. 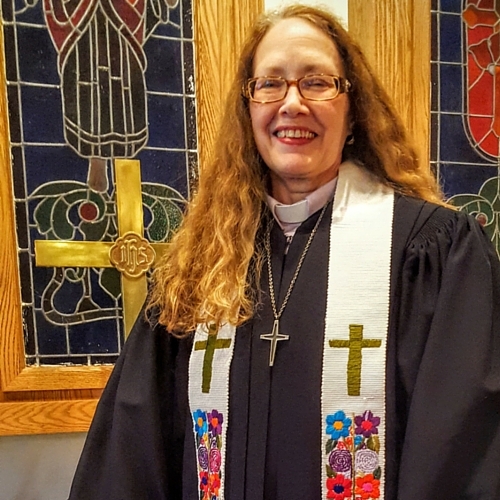 Catherine was ordained by The Fox Valley Association of the Illinois Conference of the United Church of Christ UCC in 2010. She is a 2008 graduate of Chicago Theological Seminary, Hyde Park, Chicago with a Masters of Divinity degree. She graduated with her Bachelor’s Degree in Liberal Arts/Literature from Columbia College, Columbia, Missouri in 2004. The Board is very excited to have Rev. Catherine available to you should you have any pastoral needs. Please come meet her on March 11! ” While you are on this exciting walk to define your future as a people of faith, I am honored to be walking with the Tree of Life Community as a Pastoral Care provider. This is a unique situation, and the following, while not a classical Biography, may offer you some helpful insight into who I am and how I might be able to walk with you in this special time. I come from a predominately non-churched family. Following the cultural norms of the time, my siblings and I were all baptized, eventually … (I was five years old), but in retrospect our family made it clear to me that “church” the institution, and God, the Creating Force of the Universe, were not one and the same. My parents moved across town the summer between my 5th and 6th grade years. To help me stay in touch with my best friend from our old neighborhood, I asked my parents to take me to my friend’s church on Sunday Mornings. They had a great children’s choir, and my friend and I had been singing together at school, making it a great way to stay connected during this transition. The friendship faded, as young friendships can, but my love of church remained. With my parents help, I continued to attend, and I voluntarily added 2 years of Confirmation classes with my peers to my schedule. My parents produced the required proof of Baptism, but cautioned me that this Missouri Synod Lutheran church probably would not understand or approve of the fact that my Godmother was Catholic and my Godfather was Jewish. As I knew my Godparents had taken their vows to care for me seriously, and both had exposed my siblings and I to the ideas and customs of their individual faith traditions, and I knew them to be kind, loving people, I did not share this additional information. I learned early that there are many pathways to God, and I decided that, while all of them had some to much validity, I was sure that none of them had it “quite right”. This is God we’re talking about. I don’t think we humans do, nor perhaps are supposed to, fully understand this core Mystery of the Universe, but that we are all called to try. In voicing this, my reality, Lightening did not strike, and my walk with God continued, in my still unchurch family of origin, and with my loving mixed religious influences, all strongly underpinned by the beauty of the music of the church. Music continued to be my linchpin to the church, and through music I stumbled into the UCC. It was magical to find this denomination that ordained Women and Gays. One that had the most liberal and open official theology and policies I had ever encountered. Open and Affirming, the UCC’s program and policies of full, open declaration of the member churches embracing of all of God’s children regardless of sexual orientation or gender identification was an additional huge step in what I saw as the just and Godly direction. I got even more involved. Due to my increasing level of participation, I engaged in the denominations advanced Lay Leadership education programs. This eventually led to my call to seminary and Ordained Ministry. I was excited to be on staff when First Congregational Geneva went through the discernment process of declaring themselves as Open and Affirming. I love to read, especially Science Fiction/Fantasy and Mysteries. I confess to watching too much TV when time permits. In juxtaposition, my favorite exercise is walking. A mile plus daily, weather permitting. Music is a huge part of my life, and I have recently taken up the piano. I will admit to missing being at school, in the educational forum, having spent many of my adult years back at school while working, and I continue to look for learning opportunities. I feel it is imperative to continue to grow and challenge ourselves.